you will be bored to tears by my continual referral to the shiny drum workshop kits sitting patiently in the spare room, waiting for fame and fortune to come calling. the smaller, twelve year-old jazz edition is resplendent in a natural maple finish, while the second, larger version which almost inadvertantly came into my possession, is mere months old. yet its finish ply is known as vintage marine pearl, reminiscent of those favoured by gene krupa, buddy rich, louis bellson et al. but of course, it is darned near brand new. yet in those spare moments, when the interweb isn't looking, i spend the odd minute or two looking at bona fide vintage kits rather than those meticulously prepared in oxnard, california. despite obvious failings such as being less than perfectly round and occasionally less than pristine woodwork and internal varnishing, there's a cachet attached to vintage drums and cymbals that can only be visually replicated in the modern idiom. not everything deteriorates with age; the sound of vintage drums and cymbals is a grail constantly searched for nowadays. oddly, however, and much to my national shame, the vintage kits and snares which i have been persuaded are the most sought after and thus on my hypothetical shopping list (as if i need more drums), are those from across the pond. yet there are perfectly good and beautifully sounding british drumsets which can be acquired for considerably less money. i am not, however, naive enough to think that this state of affairs is exclusive to the percussive realm. despite acres and acres of carbon fibre on show in taiwan, london, freidrichshafen and las vegas, steel has resiliently refused to keel over and go away. in fact, rather than make every effort to discriminate between various levels of nano-fibres, more and more amongst the pelotonese are seeking out vintage bicycles, safe in the conviction that they made them to last in those days. and in similar manner to that of the noisy stuff related above, much of the fascination with vintage is often concentrated around italiana with one or two ventures into the french realm. 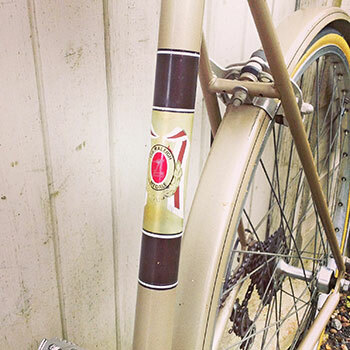 this despite the existence of iconic brands on this side of the channel such as raleigh, carlton, mercian and swinnerton, built with reynolds competition tubing and saddled with leather from smethwick. what an odd nation we often are. i'd be the last to argue against the convenience of indexed shifting via the brake levers and ramp assisted shifting over all eleven sprockets. having been brought up in the tail end of the so-called vintage era, i still change down a gear or two before i need to, even though modern shifting systems will allow gear-changes even under pedalling pressure. it's now a chicken and egg situation; whether the appeal of rides such as l'eroica came prior to the fascination with yesterday's velocipedes is surely a matter for discussion at the coffee stop? whichever is adjudged the priority, william alves and his wife carol have found great favour with the current predilection for days gone by. both dyed in the wool cyclists, they've spent most of their summers cycle-touring around europe with a tent and panniers, often favouring the french alps. 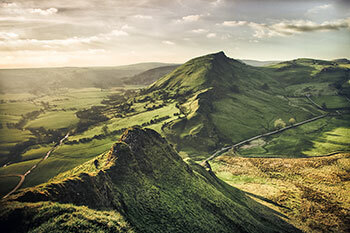 "My wife Carol works for the Peak District National Park and as part of her tourism job, was asked to look at whether L'Eroica would work in the Peak District. So we developed the routes and when one of the original event organisers from Gaiole, Claudio Marinangeli, came to see what he thought of the countryside, we were asked if we could lend him a bike. "That is when the idea for 'Glory Days' took off and I have been buying bikes since December 2012. I realised that people would need a steel vintage machine, so I started to acquire them." i made mention of glory days recently when discussing the chiltern cycling festival and the chenies velo classique, both featuring the opportunity (or necessity) of riding pre-1987 steel bicycles. "We went to Gaiole in Tuscany to see L'Eroica and how the process worked there. Obviously it was a gamble to invest in buying bikes, but they can still be bought for the price of a top carbon saddle." and saddles are every bit as important to the equation as lugged steel. 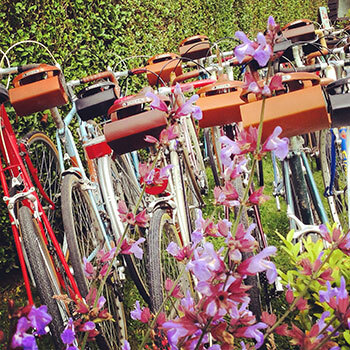 while it's a bicycle component than remains mostly hidden from view while riding, you can imagine how unsavoury a sight it would be to view a peloton of vintage bicycles left against the cafe wall, seatposts topped with modern, plastic saddles. 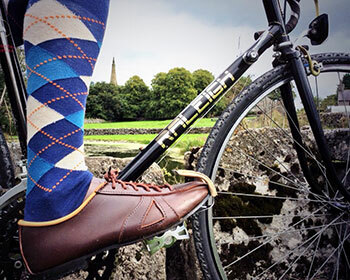 brooks leather is realistically the only appropriate solution. "When the Eroica Britannia was confirmed as being in Bakewell, I contacted Brooks and asked them if they needed any bikes. They were bringing over journalists to cover the event and as the only person doing vintage bike hire, I had agreed to hire out 30 bikes. Finding the bikes was ok, but we had a slight panic just before June when Brooks gave us the sizes of the journalists who'd be riding the bikes." though you'd be perfectly justified in being a tad miffed if your brand new campagnolo super record groupset played up while riding the uk's equivalent of the strada bianche, bicycles and components conceived and built prior to 1987 might not offer the same slickness of operation. in fact, there's a distinct possibility that compnentry of a certain age ought to be handled with kid gloves and treated with a degree of respect. sadly, having been even tangentially involved in bicycle hire here on islay, few hirers make that sort of thing their first priority. 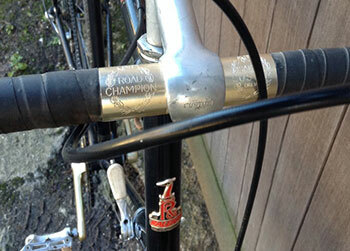 how did william's vintage cycles fare in this respect? "We had several people other than the journalists renting bikes from us, and thanks to Dan my brilliant mechanic, we only had one mechanical issue with 40 bikes riding either 55 or 100 miles that weekend. Unfortunately, it's a fact of life that axle sizes and even rear dropouts varied quite a bit, so I now try and buy standard sizes. But often putting a new wheel on an old bike can involve work." the glory days' bicycle fleet consists exclusively of british built steel bicycles (and why not? 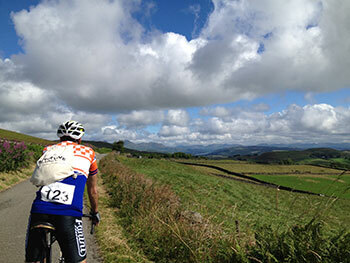 ), yet the original l'eroica takes place of the limestone farm roads of italy. in order to preserve the connection and add a certain italian flavour to the british variations, you'd figure that riding elderly pinarellos, colnagos or battaglins would perhaps be an appropriate move. "The Italian event is to celebrate the Chianti region, so I feel that L'Eroica Britannia should celebrate the Peak District, local food and drink and the amazing variety in frame builders of the 1960-80s. 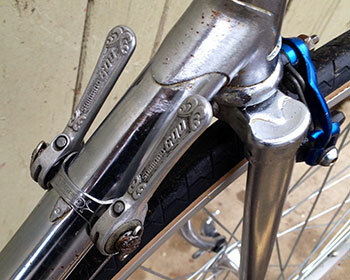 "Carol had a custom frame built by Vernon Barker and last month he repaired a broken rear dropout on a Raleigh for us. He is in his eighties and still working. These steel bikes will last. And perhaps more practically, British bikes normally all have the same size threads and axles rather than the French and Italian vagaries. "We buy local bikes, Swinnerton, Carlton, Mercian and Raleigh. The Holdsworth and Butlers come from London. We'll always try to be the best, so we now only have 531 or 501 tubed frames." though sadly not of my origination, i've always thought that 'ride of the falling rain' is a particularly clever name for a bike ride. it's certainly a marketer's dream; if it's dry and sunny, it's a bit of a bonus; if it rains, well, we did tell you. however, we may have been usurped by a couple of the rides mentioned on the glory days website, namely the tour de frites and heroes, just for one day. aside from the joy of riding vintage bicycles, it would be worth riding both events for the names alone. whose idea were those? "The 'Tour de Frites' is a great ride to the chip shop for great chips. 'Heroes Just For One Day'? Well it's image again. Most people are taking part because the image is great. It's surprising how many people aren't what we would call proper cyclists and don't realise how tough the event is. We want people to have a great day out, a mini adventure if you like. But to make sure they enjoy it, most of our bikes are ten or twelve speed and have puncture resistant tyres". image, however, is everything. when sat aboard a vintage bicycle ridden at speed, dressing in a castelli gabba jacket and endura movistar shorts is unlikely to bring anything traditional to the party. in cases such as l'eroica britannia and the chiltern cycling festival it would verge on the impolite not to dress appropriately, preferably in itchy scratchy wool. even a brief perusal of the glory days website will alert you to the availability of said garments. were they an intrinsic part of the glory days strategy, or as a result of unrequited demand? 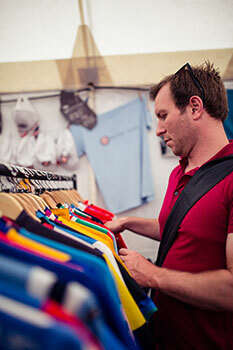 "We sold lots of vintage jerseys at last year's event and to be honest, see it as a bit of a sideline. Renting a bike, on the other hand, means at the end of the day we still have a bike, but we're aware that people want to look the part and are keen to buy suitable jerseys. The problem is finding vintage jerseys in larger sizes." even in the world of retro, implicit contemporary pressures mean that standing still is often not the option we'd like it to be. though there may be others already offering a similar service to that of glory days, while several contemplate joining the fray, have william and carol considered future expansion or even the possibility of franchising their unique approach?" "The whole of the retro scene is still expanding. Events such as L'Ancienne and Chenies will grow. We'll be going to Barcelona this year as well as the Retro Ronde in Belgium, meaning we'll be less dependent on just one day in June. "We'd like to do more guided bike rides but currently it's a great hobby and we don't want to grow too big. By December last year all our bikes were already booked for June 2015 and we've had to find a few extra for returning customers. 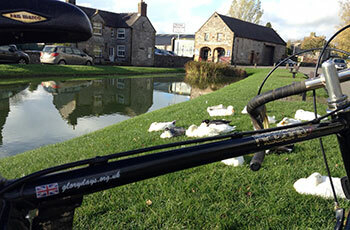 We have also lent bikes to 'VisitBritain' for film work and promotional videos." so, just like the world of drumming, though there are many still happy to produce vintage style, yet modern products, for the true vintage experience it seems there's nothing like the real thing. which sort of makes sense really, for who would order a steven shand skinnymalinky and insist that he braze gear lever bosses at the top of the downtube?